QUESTION: HOW DO I PAY FOR THE ORDER? WHAT ARE MY PAYMENT OPTIONS? Answer: Please email us with the item no. and I will send you a Paypal invoice or you can pay by check. In case of personal checks, once I receive the check and it clears, I will then mail the item. QUESTION: DO YOU SHIP INTERNATIONALLY? CURRENTLY, WE ONLY SHIP WITHIN THE 48 CONTIGUOUS STATES VIA USPS, but contact us if you want the package delivered internationally before placing the order. INTERNATIONAL SHIPPING CHARGES AND INSURANCE WILL BE ADDED TO THOSE ORDERS. Also, we do not ship to P.O. Boxes because of security reasons. QUESTION: WHO CREATES THE JEWELRY? Answer: Every piece is made by me in my home studio in New Jersey, USA, each piece is hand crafted and takes hours and sometimes weeks to make depending on the size and detail required. All the beads are sewn on securely with a needle and thread, glue is only used for crystals and large cabochons. All of the pieces are backed by Ultra Suede. I use only the best and the highest quality of Japanese beads, gorgeous semi precious gemstones and the most beautiful, exquisite Swarovski crystals. My material comes from all over the world. QUESTION: CAN CUSTOM PIECES BE MADE? Answer: Yes, I can create whatever you suggest, statement pieces, small pieces, whatever suits your taste and style. 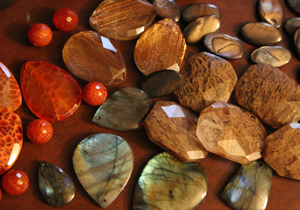 If you have any special stones you would like to use, please contact me and we can discuss what can be made. QUESTION: HOW CAN I TAKE CARE OF MY JEWELRY? Answer: Please keep in mind that this jewelry is made by hand, although it is embroidered on, a strong nylon thread is passed through the beads 2 or three times and then sewed down every few beads so it is very secure. At the same time, please take care in wearing it as it is made by hand and not manufactured by a machine, treat it like you would a fine piece of jewelry. Let it be the last thing you wear after lotions, perfumes and makeup. The backing is Ultra Suede and I used a darker color so it would not get dirty. QUESTION: WHAT IS THE DELIVERY TIME? Answer: If the item is in stock, I will ship it out within 2 to 3 business days of receiving payment and then will take 3 to 5 business days to get there. If you require something urgently, please contact me, I will try my best to get it done. If a custom order is placed or I have to make a Re-Orderable item, delivery time will include ordering stones, having them delivered from international locations and then the piece has to be created, so please keep that in mind, it could take a few weeks. I would definitely advise you of any delays for reasons beyond my control. 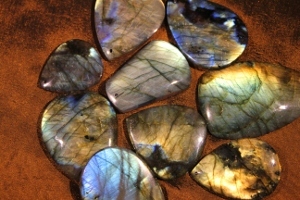 Labradorite was first found in 1770 on the Labrador Peninsula in Canada. It is also found in Norway, and the former USSR. Labradorite is a power stone, allowing you to see through illusions and determine the actual form of your dreams and goals. It is excellent for strengthening intuitions. It is used to stimulate imagination, develop enthusiasm and thus, new ideas and to see more clearly in meditation. Labradorite is truly a fascinatingly beautiful mineral. Its a mineral whose charm is not fully noticed and may be overlooked if not viewed from the proper position. Generally a dull, dark looking mineral, Labradorite can produce intense colors that range from the typical blues and violets through greens, yellows and oranges. 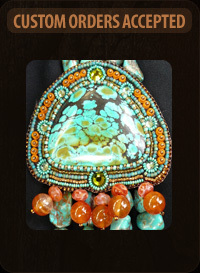 Turquoise is a beautiful gemstone that comes in color range from green to light blue with dark veins of black and gray. Normally, the bluer the stone the more it is worth. It is a staple in Native American jewelry designs and much of it is mined in the western United States; however, it is also available in Iran. 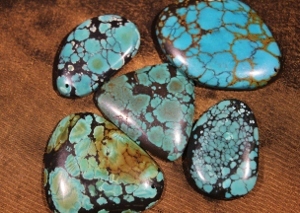 While Turquoise is found in places with high concentrations of copper, it is mostly mined in Northern Iran, the Southwest of the United States, Pakistan, Mexico, Israel and China. It should be noted that the highest quality Turquoise, that of sky blue is usually found in Northern Iran and sometimes in the Southwest of America. It is a truly magnificent looking gemstone and it is usually very affordable. Tiger’s Eye has been known for thousands of years and has many medicinal and mystical properties associated with it. It is said to stabilize one and to protect the wearer from evil and illness. 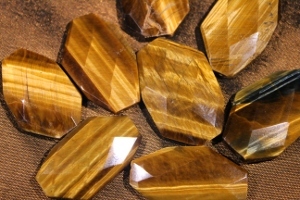 Tiger’s Eye resembles the color and patterns of a Tiger’s Eye. It includes the colors of yellow or honey, red and brown. It usually comes with a very silky luster and is made from the fibrous type of Quartz (cryptocrystalline). Most of the time, these colors are either in lines or bent. This beautiful gemstone is usually very affordable and has been known to man for thousands of years. This gemstone can be found mainly in South Africa, however, Tiger’s Eye is also known to form in smaller quantities in Canada, China, Brazil, the USA, India and Burma. This stone emerged a couple of years ago as "fire agate". To avoid confusion with true fire agate (which is rare and very expensive), it is now increasingly being referred to as "crab fire agate". No matter what you call it, this is a truly unique and beautiful stone! Crab fire agate beads have a glowing rusty orange color with scattered veins of gray-white. 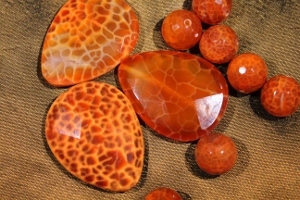 Rather than having the distinctive banded appearance of many agates, crab fire agate has a “crackled” look. The web-like pattern of white crackles is created via heat treatment, and color enhancement produces the fiery oranges and reds. Some of the beads are translucent and seem to glow from with within. 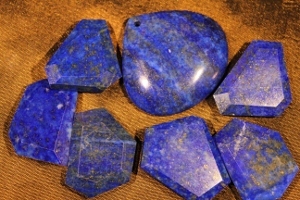 Lapis lazuli is regarded by many people around the world as the stone of friendship and truth. The blue stone is said to encourage harmony in relationships. Lapis Lazuli is a gemstone of the kind that might have come straight out of the Arabian Nights: a deep blue with golden inclusions of pyrites which shimmer like little stars. This opaque, deep blue gemstone has a grand past. It was among the first gemstones to be worn as jewelry and worked on. It is mostly found in Afghanistan. Mother of Pearl is wonderful mineral that is created by living organisms. It is usually called an organic mineral. There are only a few organisms that can create Mother of Pearl, one being oysters and the other abalones. 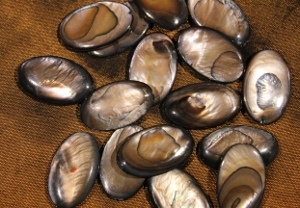 Mother of Pearl can be found in many regions including Japan, Australia, Europe and the United States. It is said to have many magical and mystical qualities such as helping a person to be cleansed, to help a person have faith and to be pure. 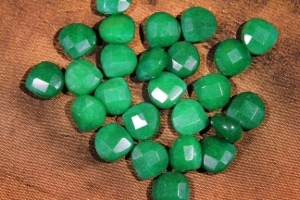 Jade is one of the most popular gemstones and has enjoyed an extremely rich history throughout the world. While popular in Europe, the America’s and Africa, it does not compare to its popularity and traditions in Far East Asia. Jade is found in many regions and usually comes in large blocks. It is usually found in Asia, specifically China and Myanmar, as well as Russia, and South America. Rutilated quartz is found in Australia, Brazil, Kazakhstan, Madagascar, Norway, Pakistan and the United States. 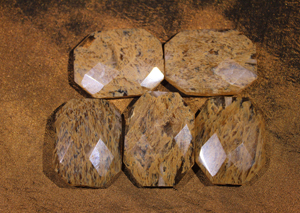 It has beautiful inclusions that range from golden to brown.